The Environmental Working Group (EWG) has published a new report for the 2017 shopping season that rates produce on the amount of pesticides they are likely to contain. For the second straight year, strawberries have surpassed apples taking first place on the list, which has become an immensely popular resource to determine where best to spend your organic dollars. But read between the lines and you’ll find that there are two “highly toxic” (non-organic) vegetables to be aware of that didn’t make the EWG’s ‘Dirty Dozen’ list this time around. When the U.S. Department of Agriculture (USDA) tested 35,200 different produce samples they found that pesticide residues still remain on many samples even after thorough washing, with several different types represented including the “probable human carcinogen” glyphosate, the main component of Monsanto’s Roundup weedkiller. As if that wasn’t bad enough, considering how popular these foods are, there are two other vegetables that actually contain two different highly toxic insecticides not found in any other produce — and they could be a part of your next salad. 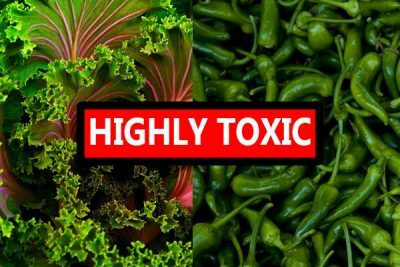 Leafy greens (kale and collard greens) and hot peppers, although not in the “dirty dozen,” may contain “trace levels of highly hazardous pesticides” that are highly toxic to the human body. The pesticides that are especially concerning are insecticides: organophosphate, and carbamate. Because of legalities and voluntary opt-outs they are not found on other produce. Hot peppers tested high in acephate, chlorpyrifos, and oxamyl in 2010-2011. They are banned to use on other crops, but allowed on hot peppers. 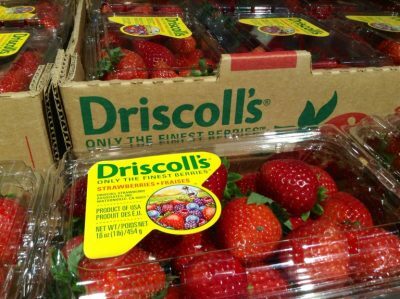 Strawberries were just added to the 2016 ‘Dirty Dozen’ list. Acephate is a possible carcinogen, and is a reproductive health hazard. Chlorpyrifos is a neurotoxin. Oxamyl can lead to kidney and liver damage (source: www.beyondpesticides.org). Collard greens have previously tested high in chlorpyrifos, famoxadone, oxydemeton, dieldrin, DDE and esfenvalerate in 2007-2008. Chlorpyrifos and esfenvalerate are not used on other crops, but allowed on greens. DDE and dieldrin are now banned, but still end up in leafy greens from the residues found in the soil. Famoxadone has been linked to kidney and liver damage; oxydemeton is toxic to the reproductive system; dieldrin increases the risk of multiple myeloma; DDE is associated with aneuploidy (chromosome mutation); and esfenvalerate is a neurotoxin. Because of the high toxicity of these pesticides, it is recommended to buy leafy greens and hot peppers organic, and if not possible to reduce the pesticide content by cooking these vegetables. Hot peppers come in at #13 because of the aforementioned concerns, although they technically are not part of the Dirty Dozen in 2017 they are in a special “Dirty Dozen Plus” category. See the full list of nearly 50 types of fruits and vegetables ranked from most pesticides to least pesticides here. The Clean Fifteen is the list of the vegetables with the lowest pesticide count, however, they still contain them at low amounts. For more details, you can check out the full list above. In the meantime, avoiding the Dirty Dozen (and the two additional vegetables listed above that most people don’t know about) is an excellent place to start if you’re interested in saving money on healthier food.